My first UFO is done, only the rest to go..... I'm quite pleased with it. I like the colours and the differet textures. 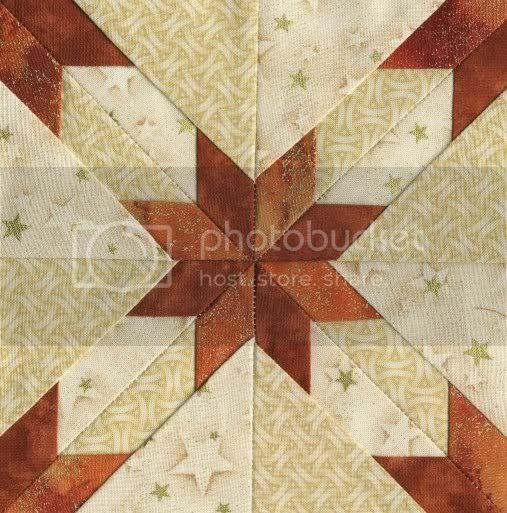 The quilt is a blend of cotton fabrics and linen. For the quilting I sewed "in the ditch" through the blocks and continued the seam on the whole block. I also quilted in the ditch around the green border, on both sides of it. On the outer border I used " borders made easy", which is a pre-made quilting pattern on a roll with adhesive on the back. It was fun to use, but I'm not very good at keeping a straight line if I have to follow one that is alreday there, so I will have to practise on a few other quilts as well. Have a wonderful and creative week!! Takk for koselige kommentarer i bloggen min. Alltid hyggelig å oppdage nye navn og blogger i kommentarseksjonen. Jeg her kost meg med besøket her også.